Jawahar Navodaya Vidyalaya Admission Last date to apply is November 30: Jawahar Navodaya Vidyalaya Admission Last date to apply is November 30 for 9th class admissions The registration process for 9th class admission is going on through the official website. The registration process has started from November 1 and to continue till November 30, 2018. The interested and eligible candidates can apply online through the official website of JNV - navodaya.gov.in. The entrance exam for class ninth admission would take place on February 02, 2019 at various Jawahar Navodaya Vidyalayas across India. The Admit Card for the class ninth entrance test can be downloaded from the official website form January 22, 2019 onward, till the exam date. The result for the same will be declared on the last week on March 1 2019. A candidate who has not been promoted and admitted to Class-VIII before 30th September, is not eligible to apply. Government of India started Jawahar Navodaya Vidyalayas (JNVs) all over the country except the state of Tamil Nadu. These are co-educational, residential schools, fully financed by Government of India and run by an autonomous organization, Navodaya Vidyalaya Samiti, under the Ministry of Human Resource Development. Though admission to Navodaya Vidyalayas is at Class VI level, in order to optimally utilize infrastructure facilities available, vacant seats at Class IX level are filled through an All India level Admission Test. While education in the schools is free including board & lodging, uniforms and textbooks, a nominal fee of Rs. 600/- per month is collected from the students of Classes IX to XII only. In respect of ward of Govt. employees, fee @ Rs.1500/- per month has to be paid. However, students belonging to SC/ST categories, Girls & Boys from families whose income is below poverty line (BPL) are exempted from payment of fee. The last date to apply for the admission test is 30-11-2019. 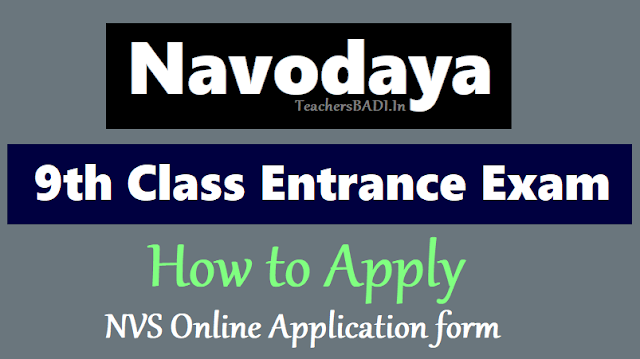 Navodaya Vidyalaya Samiti Online application Form for Lateral Entry admission to Claass IX against Vacant Seats. Steps to fill the Navodaya 9th Class Entrance Exam 2019 Online application form. Step 3: Click on the Link of "Candidate to click here for Registration"
Step 7: Now, Click on the Proceed button. Step 12: Click on the Submit Button. Step 13: Take the Print and preserve it for future reference. 1. Certified that the information given above is true to the best of my knowledge and belief. In case any of the information given above is found incorrect, I will abide by the decision of the Samiti.